Product information "Klober Dry Verge Univeral Angle Ridge End Cap"
Comaptible with Uni-Dry and Uni-Click systems! 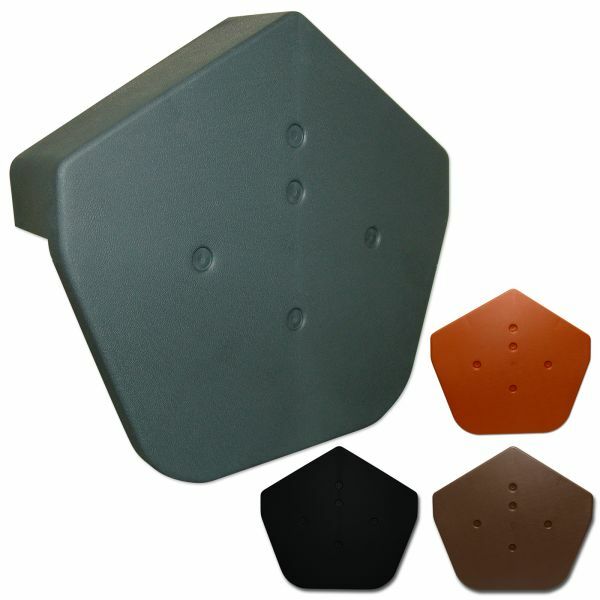 These polypropylene dry verge ridge end caps are designed specifically for use with the Uni-Dry and Uni-Click dry verge systems manufactured by Klober, a leader in professional roof ventilation and accessories. If you're looking for a quality product that you can trust, look no further than Klober. Klober produce two styles of hardwearing and UV safe ridge end caps, these are the Half Round and the Universal Angle. So you can be certain that there is a style to suit your property. The angled top of the Univeral Angle Ridge End Cap can be used with both standard ridge and round ridge roofs. The end cap measures 270mm across at the widest point, 244mm height and 58mm return. The Uni-Dry Verge system is deisnged to provide a mortar-free, maintenance-free, secure method of fixing concrete interlocking verge tiles. The Uni-Dry Verge system can be retro fitted to existing buildings and are equally effective when fitted to new properties. Related links to "Klober Dry Verge Univeral Angle Ridge End Cap"
Customer review for "Klober Dry Verge Univeral Angle Ridge End Cap"